In a recent article, I discussed the steps in my air layering propagation technique as well as the instructions on how to harvest and plant the air layers or marcots. This air layering method has worked well enough for me on the garden plants I propagated like the Hibiscus, a Chinese Bell Flower plant, Nong Nooch Vines and several Mandevillas. In this article, I'll discuss the tools and materials I have in my "Marcotting Kit" which I bring out everytime I air layer or marcot garden plants. The materials I use for air layering are cheap and some, virtually free. This marcotting kit is not only convenient to use, but it also makes your air-layering activities around the garden quick and organized. The kit I use for air layering is contained in a small clear plastic box with a snap on cover. I remember this box is one of those freebies that come with grocery items in the supermarket. 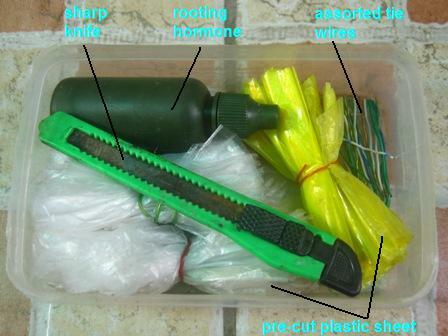 Shown below is the marcotting kit and its labeled contents. 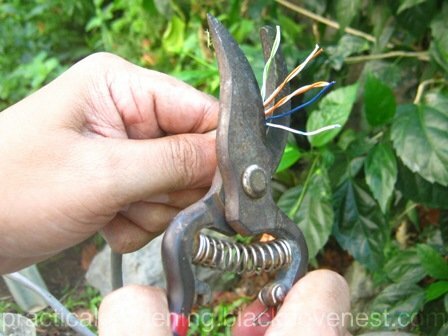 It doesn't need to be extra sharp, but it needs to have a thin blade that can cut and scrape soft stemmed garden plants. In fact, an old disposable razor blade will be sufficient. Just be careful when handling double edged disposable blades. What I'm using is a cheap ordinary paper cutter from a school or office supply store. I'm just starting to use this and it's no guarantee though to promote rooting. I've air layered plants successfully without a rooting hormone, but I just tossed the bottle in the kit after reading somewhere that it can help. Supposedly, put a little hormone on the air layer wound before packing it with the potting medium. 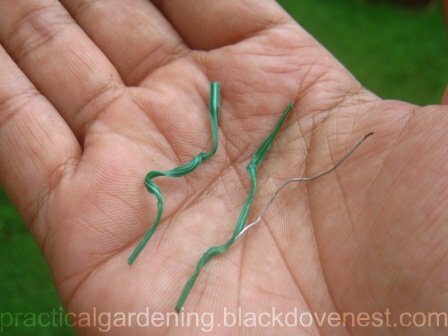 Conventional store-bought twist ties can be handy in the garden. But they have a tendency to get frayed and flimsy over time. After a few times of use, the plastic coating separates from the wire as shown below. What I use instead are thin wires. I get these practically free from discarded multi-wire cables. They're individually coated and don't rust. I use these for tying stuff around the garden. They're thin yet reasonably strong to hold garden plants and structures. I simply pre-cut a few tie wires from these cables and put them in the box. 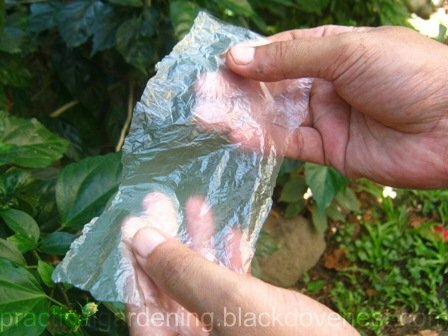 Only since the development of polyethylene film has air layering become a practical method of propagation for the home gardener and amateur horticulturist. And I believe plastic sheets (polyethylene film) have then since made it quicker for air layering as a propagation technique to catch on. Some sheets are thin and a bit elastic thus making wrapping the marcot ball much easier. As much as possible, I use clear or transparent plastic sheets, so I can see how the roots are developing. I have a couple of colors (clear and yellow) and use them alternately, one color at a time for a whole batch. This allows me to keep track which month I made the air layer. The plastic sheets I use mostly come from bread wrapping or bags. I cut them in various sizes, roll them up and bundle them according to size. The above are the contents of my Air Layering or Marcotting Kit, but there are other air layering materials and tools I use outside of the kit.